Each puzzle consists of a grid containing clues in various places. Every clue, except for the 1’s, is half of a pair. 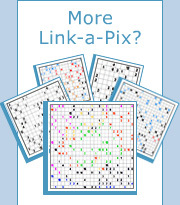 The object is to reveal a hidden picture by linking the pairs and painting the paths so that the number of squares in the path, including the squares at the ends, equals the value of the clues being linked together. Squares containing 1 represent paths that are 1-square long. Paths may follow horizontal or vertical directions and are not allowed to cross other paths. Each puzzle consists of a grid containing colored clues in various places. Every clue, except for the 1’s, is half of a pair. The object is to reveal a hidden picture by linking the pairs and painting the paths so that the number of squares (including the squares at the ends) and the color of the path is the same as the value and the color of the clues being linked together. Paths may follow horizontal or vertical directions and are not allowed to cross other paths. Each puzzle consists of a grid containing B&W or colored clues in various places. Every clue, except for the 1’s, is half of a pair. The object is to reveal a hidden picture by linking the pairs and painting the paths so that the number of squares in the path, including the squares at the ends, equals the value of the clues being linked together. In the case of color puzzles, the color of the path should be the same color as the clues. Paths may follow horizontal or vertical directions and are not allowed to cross other paths.